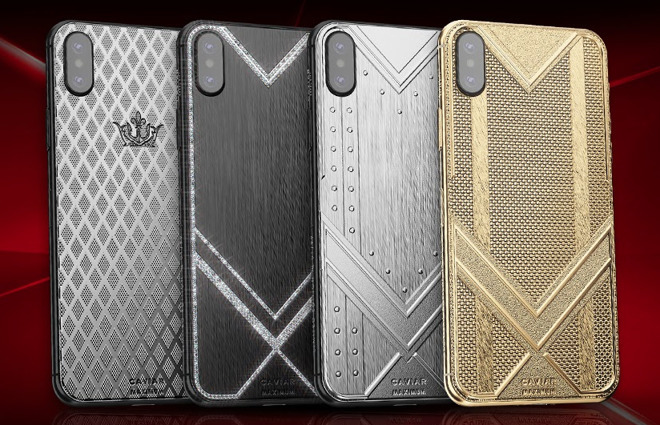 Caviar's Maximum Collection are all based on the iPhone XS Max, with the company electing only to offer the highest 512GB-capacity models in its range. The iPhones themselves are exactly the same as the standard models, except for the rear casing, which is replaced by one of a number of upscaled versions to make them a more luxurious device. The Maximum Invincible model is billed as a design reminiscent of durable objects, such as a tank or armor, with mock rivets and plates on the rear. The casing is made from a 1-millimeter plate of hardened titanium, which is claimed to be able to stop a bullet. Using carbon instead of glass on the back panel, the Maximum Ultralight is lighter than the standard iPhone XS Max, making the unit 8 grams lighter than the Apple-supplied model. The back uses a a textured diamond pattern, which the company says gives it a "special modern style." On the more expensive end of the range, the Maximum Diamonds version is a combination of black PVD coating and diamonds, with 400 of the gems applied in a pattern on the rear of the iPhone. There are two Gold models in the collection, with the Maximum Gold featuring a gold-plated casing, while the Maximum Fine Gold version is made of a solid gold panel weighing 150 grams. The Caviar Maximum range starts from $5,200 for the Maximum Ultralight, with the Invincible selling for $5,500, and the Maximum Diamonds for $9,890. The Maximum Gold costs $5,960, and the Maximum Fine Gold is the most expensive at $15,340. All models are supplied in a wooden lacquered case lined with black velvet, authenticity and company warranty certificates, a USB cable, and a charger. Obviously, there's no way to get service at an Apple store given the modifications to the device that Caviar has made.